Left to right: Lavender Girl narrow silk headscarf in Orange Crush, $36; Starlet in Plum, $42; and Thin Indie Band, $24. Already a must-have for Hollywood actresses and sold at LA's trendiest upscale boutiques, Lavender Girl's headbands and accessories are a stylish compliment to any outfit. Ranging from $3.50 for an ultra-hip hair twist to $62 for a luxe Bejeweled headband, Lavender Girl typifies LA casual cool and Bohemian chic. The Los Angeles mother-daughter duo behind the label use only the finest Italian leather and hand-dyed fabrics. Popular styles include: the Bond Girl II double-strand headband, the stretchy braided metallic Goddess Braid, Bejeweled, and the braided silk cord and chain Swiss Miss band. 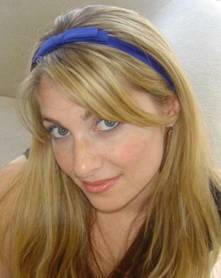 The Lavender Girl Bond Girl II headband retails for $32 at www.lavendergirl.com. Celebrities who have been photographed wearing the Bond Girl II style include Eva Longoria, Jessica Alba, and Vanessa Hudgens. Left to right: Swiss Miss in Rose Gold, $24; Itsy Bitsy Heartbreaker Bow in Royal, $36; and Bejeweled in Sand, $62. Lavender Girl headbands can be found at fine retailers including Henri Bendel, Fred Segal Beauty, Prive NY, and Wink NYC, as well as www.lavendergirl.com. Learn more about the fashion celebrities mentioned in this article.